ABB is taking the digitalization of power grids design technology to the next level with its innovative new 3D/VR design and planning tool, being demonstrated live at CIGRE 2018, in Paris from August 27-31. The ABB AbilityTM-enabled tool represents an industry-wide step change in design and planning technology and will optimize the process of building power infrastructure like substations, making them safer, more efficient and cost-effective. Users will be able to don VR goggles, and, as “avatars,” walk through projects. The technology could be used in the process of building FACTS substations, HVDC stations and digital alternating-current (AC) substations. The technology can be deployed from the earliest phases of the consulting and design process through to the final walk-through, saving time and money. 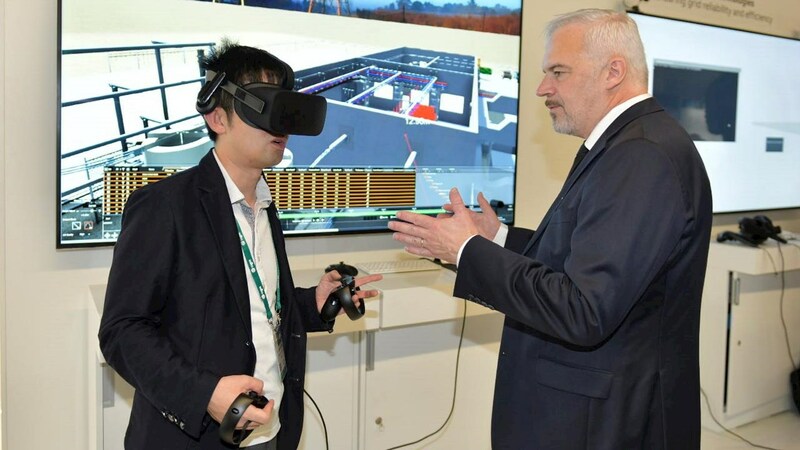 VR-based design review in the early stages will help customers “see” and adapt certain site-design elements, like spatial elements, optimized footprint and health and safety issues beforehand. Using this technology will also allow multiple stakeholders to participate in the design process, even from remote locations, enhancing communications and understanding between ABB and its customers and speeding up the review timeline. ABB 3D/VR technology is one of many digital solutions and products for utility customers available as part of the ABB Ability™ portfolio, which brings together ABB digital products and services built from a unique combination of sector knowledge, technology leadership and digital expertise to create real business value for customers. The 3D/VR experience provides significant efficiencies in project design. Please visit us at the ABB booth no. 146, 1st floor. August 26-31, 2018.